The Shining twins are one of the many reasons I refuse to watch The Shining all the way through. The Shining Twins, thankfully, is neither actual twins nor creepy in the slightest. 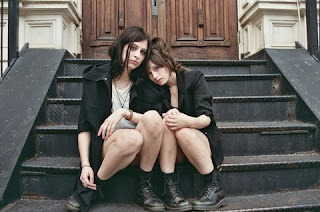 This NYC trio makes stripped-down, raw grrlie rock, badass but kinda cute. Read on to see what Aleix, Marisa, and token dude Xanax have planned for Austin this year. The Shining Twins: Two motorcycles and one side car. TST: Woodstock '94. We all met there, actually! SO weird, right? TST: Street Scene has this really nice Oxygen bar. Hopefully SXSW will have one too!